Andrew has been a physical therapist working in outpatient physical therapy practices since 2013. He has worked with a wide array of patients ranging from; orthopedics, post surgical, neurological, vestibular, balance, athletics, and chronic conditions. His treatment approach combines manual techniques; instrument assisted soft tissue massage, myofascial cupping, dry needling, joint mobilizations, joint manipulations, and massage; with advanced exercise techniques that empower the patient to take control of their own health. Andrew is also a certified strength and conditioning specialist, and personal trainer through the national strength and conditioning association. He has experience working with athletes for pre-season conditioning, and personal training clients for general health and weight loss. At Lyndon State College he taught college accredited; plyometric training and Olympic lifting courses. 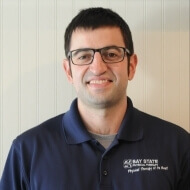 Since receiving his Doctor of Physical Therapy degree in 2013 he has taken many continuing education courses pertaining to the cervical spine, shoulder, and sacroiliac joint; as well as; soccer injury prevention and effective exercises for scoliosis. He has received certifications in dry needling, vacuum cupping therapy, and cancer exercise specialist.